Born in 1950 in Aleppo, Syria, Harut Sassounian has garnered the highest respect as a syndicated columnist, TV commentator, political analyst, author, documentary producer, lecturer and human rights activist. He served as a non-governmental delegate on human rights to the United Nations in Geneva for 10 years, as well as heads the United Armenian Fund, which provides $650 million of humanitarian assistance to Armenia. 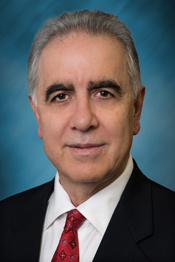 Harut Sassounian holds graduate degrees from both Columbia University and Pepperdine University and speaks five languages: English, Armenian, Arabic, Turkish and French. The story of The California Courier starts in Fresno. The year is 1958. Edmund Hillary reaches the South Pole. The first trans-Atlantic passenger jetliner takes to the skies. The US government announces plans to explore outer space. And in Fresno, a city that will forever shine brightly in Armenian memory, two young men — George Mason (Elmassian) and Reese Cleghorn — launch The California Courier. Their mission: to help propel a young, dynamic Armenian community forward, by publishing an English-language Armenian weekly newspaper, so that Armenians unfamiliar with their native language could stay in touch with community life. For half a century, The California Courier has reflected the progress of the Armenian community both in California and around the globe. As Armenians settled in communities beyond the Central Valley, the Courier expanded its reach to become the genuine voice of a growing readership. In the 1960’s, Armenian schools, churches, and organizations started to mushroom across California, and the Courier was there at every step, sharing the community’s challenges and rejoicing in its triumphs. Apart from its coverage of community news and achievements, the Courier sought to encourage discussion of social, cultural, civic, and political issues in a non-partisan manner. In 1983, as the founders took their lives in different directions, the baton was passed to Harut Sassounian, who has been publishing The California Courier and writing a weekly column ever since. Founder Reese Cleghorn went on to become a professor and Dean of the School of Journalism at the University of Maryland. In 1988, the Courier moved to Los Angeles, which was fast becoming the largest community of the Armenian Diaspora. Today, The California Courier continues to build on a storied legacy of community journalism, as a highly-regarded source of Armenian news and commentary. It remains in the vanguard of Armenian political discourse, thanks in large part to Harut Sassounian’s weekly editorials, which are reprinted in publications worldwide.